She is the last of her kind... It is not a peaceful time in the Dells. In King City, the young King Nash is clinging to the throne, while rebel lords in the north and south build armies to unseat him. War is coming. And the mountains and forest are filled with spies and thieves. This is where Fire lives, a girl whose beauty is impossibly irresistible and who can control the minds of everyone around her. I wasn't sure how I was going to feel about Fire. 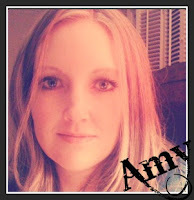 I liked Graceling (go read my review), but didn't love it. Everyone told me I would love Fire, and I did! The main character Fire was not as a killing machine as Katsa was in Graceling. Fire was definitely a little more humble than Katsa and not so feared. I did enjoy Fire more than Graceling, not only because of Brigan (we will get to him in a bit), but I liked the battle scenes. I loved Fire's character, she was a strong woman yet needed guidance. Her gift was reading minds and persuading people to do what she wanted. She was willing to do anything for her country because she had so much passion. Her name is Fire, due to the color of her hair, red+orange+pink+gold = the color of flame. The book says that her hair is "Red, brighter than the blood soaking the pathway". Her hair attracted Raptors, which are basically monster birds with large talons that want to swoop Fire up and eat her. Or, tear her from limb to limb, and then eat her! At least that's what I got out of it, anyway. Fire had to always cover her hair while she was out of the castle, and she felt suffocated most of the time. I can see that Fire was very vulnerable at times, people either stared at her with hate, envy or desire. She didn't want children, but she wanted to love someone. Fire could have anyone, and she knew it. When she meets a handsome Prince, she begins to fall for him. Brigan was a take charge prince, with amazing battle skills. He was quiet and strong. I loved his character so much. At first, I thought he was a jerk to Fire. I soon realized that he was not moved by her hair or beauty. Fire was actually going to have to work for Brigan's affection. Actually, in the book Brigan wasn't that good looking. But in my head, he was very dreamy. I pictured a very young Tom Selleck with thick dark hair and a nice mustache. Like I said, Brigan wasn't very nice to Fire at first, but that changed over time. He was very John Wayne in his behavior, which I liked. He knew how to swoon a woman, that was evident. He was a man's man. Manly. Should I keep going? I'm sure you get the idea. She woke, Blinking her eyes against a torch's violent light, held over her by a man she recognized as one of Brigan's squires. Behind her Brigan stirred. "Eyes on me, Ander," he snarled in a voice very wake and very unambiguous about it's expectations of being obeyed. There were many characters that Kristin Cashore wrote about in this 480 page book, she did a fantastic job creating a magical world with monsters, battle scenes, castles, magic, and good looking princes. 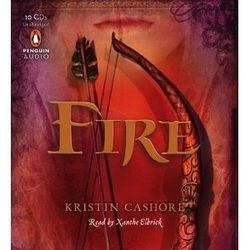 The Fire audiobook read by Xanthe Elbrick was IS AHHMAZING!!! She was brilliant... seriously. She has a wonderful British accent and read everything so flawlessly/smoothly. I found myself looking in my rearview mirror while driving trying to mimic the way she would pronounce certain words. Like Brigan, tougue rolling on the 'R' of course! So yes, I enjoyed this book and I'm about to read Bitterblue. I'm very glad I started the series. 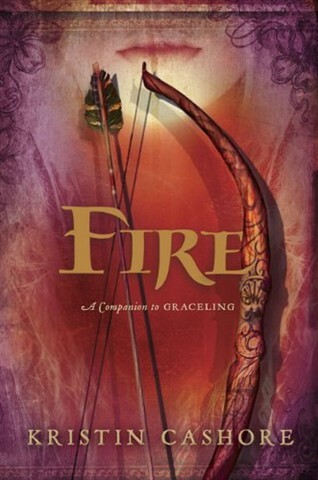 Sometimes I feel like I could have never read this series and been just fine... then I find myself thinking about this magical world with Fire, Brigan, Katsa and Po and realize maybe I like it more than I think I do. So far this series has left quite an impression, I'm sure it's the writing by Kristin Cashore. For full Fire content info go to Parental Book Reviews! I have the first book since everyone is raving about Bitterblue and the series as a whole. I'm afraid the hype might be too much to handle. Last time there was so much hype about a book, City of Bones, I just didn't love it. So I'm hoping if I start this series that I will love it like everyone else does. I also shall have to check out the audio. Read it! You won't regret it. I know what you mean though, I started TMI series and I wasn't hooked. If anything Jace was better in my head BEFORE I started the books than he was during them (this is what happens when you read only the best quotes accidently). And his relationship with Clary was meh. Read it, read it, read it!!! Chances are you'll like them, even if you don't love them. And even if you don't love Graceling, you may love Fire, or visa versa. I happen to FREAKING ADORE Graceling while only LOVING Fire.....haha. Fire was alright, the book and the character. I just prefer my characters to not be vulnerable or if they are in the beginning to grow into someone like Katsa. I guess it only makes sense that those who love Katsa aren't that impressed by Fire, and vice versa. Her humanity was a sweet trait as was her pain in being a monster. I liked how she was desperate to NOT be like her father, to be the complete opposite and how she fell in love with Brigan. *sigh* Brigan. Remember Po? No? Don't blame you, who can when there's Brigan. I didn't imagine him as you did but he was handsome in my head nontheless, and I fell hard. Po was alright but Brigan was a MANLY man and I LOVED THAT!!!! :D I loved how he couldn't stand Fire only to end up loving her. Yay! And that scene!! Eek! I died and went to heaven when he said that! Hahahahhaha. I can go on forever about Brigan so I better get off now. Glad you liked the book and I am SOOOO jealous you've got Bitterblue!!! Haha, I love you Sheepa... I don't care what you say :) Love you!!! @Amy What do you mean what I say? I was niiicceeee!!! :D Love you too! Hehe. @Andye Hahaha, the girl from Graceling and the guy from Fire; that's how we like our fictional characters! :D High five!